You may have to improvise solutions for your storage problems for laundry but there is a cheap and time-saving solution at Big W Catalogue where you can find Hills all-in-one laundry trolley priced at $99! A compact, direct and useful solution for those who do a regular amount of laundry. You can pay this price via afterpay as 4 payments. You can separate your laundries with a 50L capacity per bag. It has removable wash bags and folding feature. Also, you can lock the wheels if you want it to stay where you leave it. Airing your laundry also require some special design and thinking. Foldable products save space and they look great. Hills foldable concertina bamboo airer is one of the foldable airers and it has 9m of drying space. Another compact solution by Big W Catalogue's home sale. Also, find irons and ironing products on the same part of the catalogue. Price drop on Rusell Hobbs steam glide ultra iron is valid now. 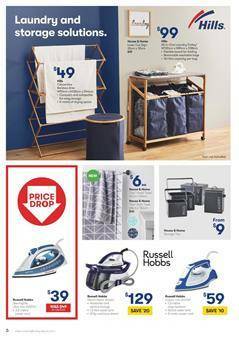 Get this product for only $39 at big W. Towels, storage tins, more steam irons and simple gadgets for laundry or ironing are available on pg 6&7.